During the next few years, over a dozen middle-income countries are likely to transition away from multilateral concessional assistance—that is, grants and loans that offer flexible or lenient terms for repayment—including support from International Development Association (IDA) and Gavi, the Vaccine Alliance. There are good reasons to worry these countries, including Nigeria and Pakistan, will find the transition tough. Despite being middle-income economies, many of them still have high rates of child and maternal mortality, weak health systems, and large shares of the population living in poverty. This is not surprising. The real question is whether the countries are more vulnerable and less ready to transition than countries that previously graduated. And, if they are, should multilateral agencies adjust their transition policies? To help answer these questions, we compared two groups of countries: a “previous cohort” of countries that have already graduated from IDA over the past decade, and an “upcoming cohort” of countries expected to graduate from IDA, Gavi, or both in the coming years. In our analysis, done together with Ipchita Bharali at Duke University and Diana Gonzalez and Kelly Flanagan at Pharos Global Health Advisors, we compared the two cohorts across five sets of indicators: macroeconomic conditions, health financing, health performance, governance, and overall poverty and inequality. The choice of indicators reflects our hypothesis that countries will find the aid transition easier if they start with a robust economy, strong governance, adequate domestic finances for health, health outcomes that are improving, and policies that promote equality. The previous cohort consists of countries that graduated from IDA between 2010 and 2015: Albania, Armenia, Azerbaijan, Bosnia and Herzegovina, Bolivia, Georgia, Indonesia, Sri Lanka, and Vietnam. The upcoming cohort comprised Angola, Congo-Brazzaville, Nigeria, Pakistan, Papua New Guinea, Sudan, Timor-Leste, and Uzbekistan. The distinction between these two groups is not strict, and some countries straddle the line. Angola, for example, transitioned from IDA in 2014 and is now in the process of graduating from Gavi. But the cohorts are generally different enough to make this comparison meaningful. We examined performance across the five indicator sets in the run up to IDA graduation. We assume 2020 as the graduation year for the upcoming cohort (except for Angola). For this cohort, the most recent available data are from 2016 or earlier, i.e., four years or more prior to the anticipated year of graduation. For each indicator, we collected data from the three most recent years (typically 2014-2016) and calculated an annual average. To make an “apples to apples” comparison, for the previous cohort we also took an average of three years of data for the period four or more years prior to graduation. Our working paper provides all the details. Unfortunately, data were missing for some indicators that we had hoped to use. In such cases, we dropped or gave less emphasis to these indicators, focusing on the ones for which more complete data were available. Looking at the averages between the two cohorts, we found several potentially important differences in all categories of indicators (Figure 1). Macroeconomic indicators: On average, GDP per capita and tax revenue as a percentage of GDP are only marginally higher in the previous cohort compared to the upcoming cohort. If we exclude Angola, a 2014 IDA graduate, the difference in tax revenue as a percentage of GDP between cohorts becomes larger (18 percent in the previous cohort versus 15 percent in the upcoming cohort). The average net debt as a percentage of GDP for the upcoming cohort is twice that of the previous cohort (31 percent versus 14 percent). Higher debt servicing obligations would make transition more challenging unless there is greater domestic resource mobilization. Health financing: In the upcoming cohort, development assistance for health as a share of GDP is almost twice as high as that of the previous graduates and the proportion of routine vaccination programs funded by government is lower. Heavier aid dependence could make their transition rocky. In its favor, though, the upcoming cohort does have a lower ratio of out-of-pocket health expenditures as a percentage of total health expenditures. General government health expenditure as a share of GDP is similar across the cohorts. Yet, as described below, health sector performance is worse in the upcoming cohort, suggesting less efficient use of government funding. Health performance: The average annual maternal mortality ratio of upcoming graduates in the period five to eight years prior to graduation is four times as high as the average for previous graduates (Figure 2). Upcoming graduates also have greater inequity in child mortality across wealth quintiles and worse healthcare access and quality. Again, these findings suggest that the upcoming cohort may find it harder to improve health outcomes for the poorer segments when donors decide to leave. Governance quality: The previous cohort performs better. The overall rating in the World Bank’s Country Policy and Institutional Assessment score—which rates countries on a scale of 1 (low) to 6 (high) on criteria related to economic management, structural policies, policies for social inclusion and equity, and public sector management and institutions—is 2 for the upcoming cohort versus 3.9 for the previous one. Inequality and poverty: The upcoming cohort has a Gini index around 3 points higher (pointing to greater inequality) and a Human Development Index 0.11 points lower. Overall, it appears that the countries that graduated from IDA in the previous 2010-2015 period had more capacity to manage the donor transition than that of upcoming graduates. The upcoming cohort seems to have, on average, lower per capita income, greater indebtedness, weaker capacity to efficiently use public resources, more limited and less effective health systems, weaker governance and public institutions, and greater inequality. We should warn that our cohort comparison has limitations. There is no hard and fast line between the two cohorts in terms of their graduation status. Data were missing for certain indicators and countries. We were not always able to obtain data for exactly matched years. And we did not weigh averages by country population level or size of the economy. Nevertheless, our initial analysis points to potentially significant differences in the two cohorts that could influence (i) the ability to transition smoothly from donor aid, (ii) the timing and nature of transition, and (iii) the policies of donor partners and the middle-income countries slated to graduate. Should certain upcoming graduations be delayed or occur over a longer time? Should weaker countries prepare earlier for transition, e.g., by investing more in their health systems and strengthening their public institutions for budgeting, procurement, and other functions? Should donors allocate more resources to this next wave of countries to bolster health delivery and financing, and intensify policy dialogue with governments to encourage commitment to domestic health spending and better governance? There are no straightforward answers to these questions. But it is clear that it will be important for multilateral agencies and the transitioning middle-income countries themselves to pursue policies that can sustain social and economic gains for the tens of millions of poor families in these countries. a Measures the difference in the under-five mortality rate (U5MR) between the highest and lowest wealth quintiles. The smaller the difference in U5MR between these quintiles, the more equitable. b A new indicator developed by the Institute for Health Metrics & Evaluation that provides a summary measure of healthcare access and quality on a scale from 0 (lowest) to 100 (highest). c Score has 16 criteria grouped in 4 equally weighted clusters (economic management, structural policies, policies for social inclusion and equity, public sector management and institutions). For each of these criteria, countries are rated on a scale of 1 (low) to 6 (high). Figure 2. 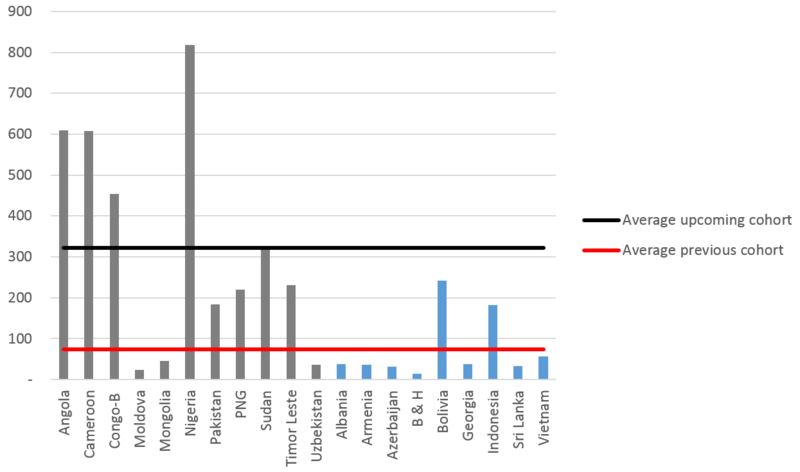 Comparison of the maternal mortality ratio (MMR; deaths per 100,000 live births) in the two cohorts of countries in the period 5-8 years prior to graduation. Note: For each country, an average annual MMR was estimated for this three-year period. The black line shows the average of this value across the cohort of upcoming graduates; the red line is the average across the previous cohort. The average MMR for the upcoming graduates is 323 per 100,000 live births versus 73 per 100,000 live births for the previous cohort.